Landscape Lighting by Echo Electrical Services, Inc. When you have landscape lighting installed, it not only will help to increase security and safety for your family, but it also enhances the beauty and curb appeal to your biggest investment! Since 2005, Echo Electrical Services, Inc. has been a leading electrician to install landscape lighting. Using only the highest quality manufacturers of low voltage outdoor lighting systems, our skilled electricians will design and install an innovative lighting system for your residential or commercial landscape. Call (817) 369-5967 for a free quote. Subtle, yet effective landscaping lighting provides safety and functionality to your home or commercial property. 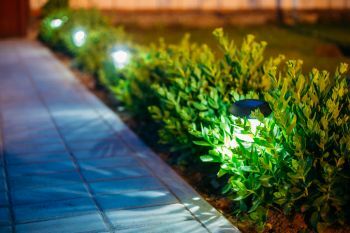 Landscape lighting provides an even illumination around your yard that helps increase the safety of your walkways, driveways and entrances once the sun goes down. Proper lighting will help guide your family and visitors around the exterior of your home. Outdoor lighting also enhances the property’s exterior beauty as well as value as low voltage lighting is energy efficient and cost-effective. If you’re looking to have landscape lighting installed for your home or business, call Echo Electrical Services, Inc.. Our licensed electricians have over 14 years of landscape lighting experience and will help bring out your property’s fullest potential!